This recipe is for everyone who a) loves buckwheat and/or beans; b) has bought buckwheat and doesn’t know that to do with It; c) wants to try buckwheat for the first time; or d) is simply in the mood for a salad, because hello – it’s around 8 billion degrees right now. It’s your multiple choice, but the important thing here is – make this buckwheat and beans salad, because life is short and this is too delicious to not try it. 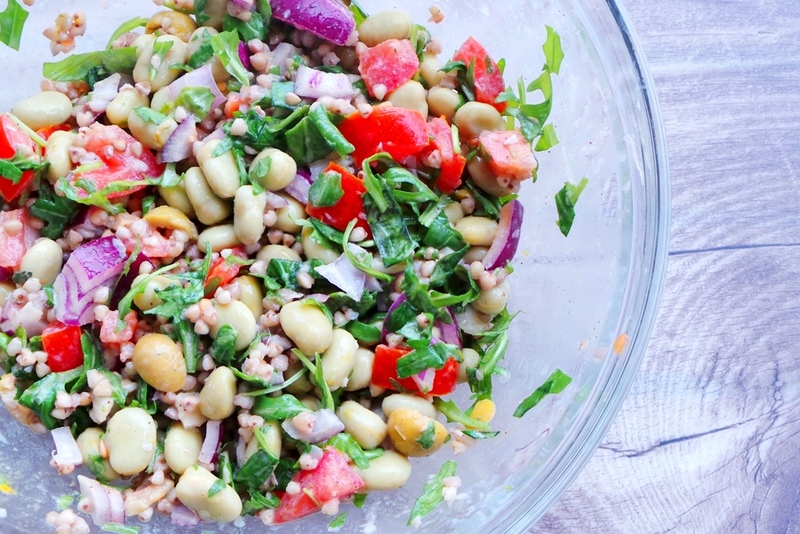 Made with buckwheat and beans this salad will not leave you hungry or in a sucky mood. Besides being super colorful and fun to look at, this recipe is delicious, satisfying, gluten-free and a perfect lunch or dinner. To be very honest with you I’m not sure what kind of beans I used. The label just said big beans and the lyrics “I like big beans and I cannot lie” popped into my head, so I bought them…They were really good, but you can use any kind of beans you have available to you – kidney beans, white beans… they’ll all do a good service here. As for buckwheat it’s my second time making something with buckwheat and I’m telling you, even the guys at McDonalds would be lovin’ it. The last time I made something with buckwheat it was vegetable fried “buckwheat”, very much like vegetable fried rice, but somehow it wasn’t really my thing, that’s why you won’t be seeing that recipe here. For this recipe you will have to cook the buckwheat ahead of time, because you need to let it cool off before putting it into the salad – one hour should be enough. The easiest thing is to make it the night before and let it cool in the fridge. In other news, I now joined Yummly, which is a magical place for people who love REAL food and not just food that’s been photoshopped more than a bikini model. At Yummly you can create your recipe box, share your own recipes and search for recipes of others according to your preferences. If you like a recipe you can “yum it” and save it to your recipe box. The registration takes about 2 minutes. To make it easier for you to yum the recipes at Beauty Bites, I’ve installed the Yum-Button. When you click on it, you yum the recipe and automatically add it to your recipe box. You’ll find the Yum Button at the bottom of each post – make sure you use it, whenever you like one of the recipes here -I would really appreciate it! Now let’s get back to this awesome salad and find out why it’s good for health and beauty. I can’t begin to explain how healthy this salad is. It’s high-fiber, rich in minerals (iron, zinc, magnesium, potassium), vitamins (C,E,A) and phytochemicals (curcumin, lycopene, quercetin). So what? All food has some fiber, minerals and vitamins. My favorite kind of salad – all these properties also make sure your skin feels and looks perfect. The nutrients are shown to fight free radicals and skin aging and this salad is also good if you suffer from acne. It’s dairy- and gluten-free and also anti-inflammatory, which help your skin clear out. Cook buckwheat according to the label instructions and let it cool off. Chop tomato, basil leaves, arugula, onion. In a large salad bowl place buckwheat (cooled off), beans, tomatoes, basil leaves, arugula, onion, a few olives, a little turmeric, black pepper and majoram. For the dressing mix in a very tiny cup/jar/bowl tahini with lemon. It will get really thick and will not look like a dressing at first. Then start adding little by little water (about 1 tbsp) – until it looks creamy and white. If you want – add the garlic – it surely brings more flavor and lots of health benefits. Pour the dressing over the salad, mix everything well and enjoy!